Work All States All Bands - The Ultimate Odyssey Continues. Recently confirmed State for a new band. Schedule of important Contest and State QSO Parties. Check the link below for the details of contest listed. 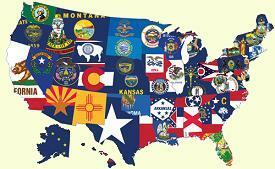 United States of America (the District of Columbia may be used for Maryland). 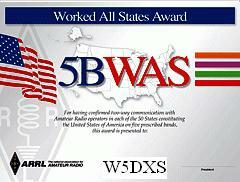 to radio amateurs worldwide, although US applicants must be ARRL members. 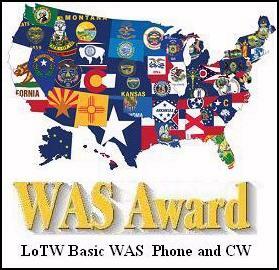 LoTW Basic WAS has been achieved in both Phone and CW mode. Thanks to all of those for QSLing and making this goal possible.